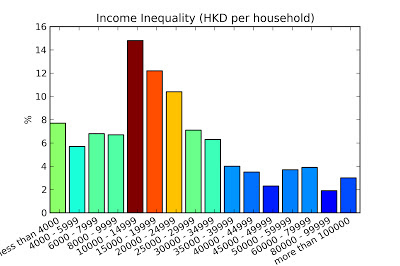 Hong Kong really is a very unusual combination of the West and the East and also of the rich and the poor. Some areas feel very Asian and Chinese, selling fruit, meat as well as clothes in local markets, there are cheap local restaurants and everything is packed inside as well as on the streets, in so little space. Walk a bit further and you'll find yourself in a completely different world - a world of gold, jewelry, luxury watches, cosmetics, sports cars and suits. Some areas are nothing else but enormous shops with luxury goods in modern skyscrapers. And in those places, you'll be surrounded mostly by westerners. This is an image you can see every day and it should give you an idea also what the income distribution will look like. I wanted to have some numbers, so I did some research and found figures coming from the government, from the year 2010. I can still remember the shock when I told some westerners what a HK university graduate's salary looks like and my amount of surprise was no less. Students who are able to obtain an university degree still haven't really won themselves a comfortable life, because the average salary is a puny 12.000 HKD per month. Monthly rent of an apartment in a cheap place (New Territories) will be around 7.000 HKD, which is more than the monthly income of 16 % of households! It is only because of government provided flats that the society has not yet collapsed. According to my information, more than half of local population lives in these flats. Of course, people are trying to get out of that vicious circle, many try very hard to study fields with prospects of a good salary (law, IT, ...), but without any passion, which turns them into mindless fact-repeating drones lacking any real understanding. The contrast is emphasised by all those low-class, presumably low-wage workers all around the place. Toilet attendants, elevator button cleaners, people who stand in hallways and warn you that the floor is wet and slippery, trash sorters and so on. No one would do these pointless-seeming jobs in Europe. 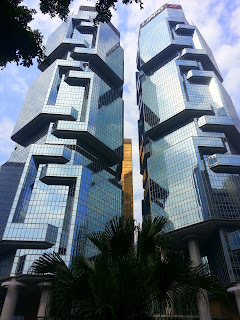 In Hong Kong, I assume, these people cannot just fall into the comfortable social security safety net. And I believe it's a good thing. Compared to plain-out begging & starvation in undeveloped countries or the opposite, getting social security while doing nothing in "overdeveloped" countries, it at least gives the people some structure in their lives. To move it from good to awesome, the government could try to provide opportunities to get a better job, perhaps by some kind of education. Now consider that the monthly rent of an apartment in Central (the, ugh, central area of the city) can be over 30.000 HKD. Most families can't even begin to think about living in that place so it's occupied by westerners, rich mainlanders and rich locals. The sky-high cost of property together with the income disparity are the biggest problems of the city. The Gini index, a measure of income inequality, is between 0.4 and 0.5, close to (if not!) the highest in the developed world. If things continue this way, I think that a part of the Honkies will be forced to move out to mainland China. It would be a natural continuation of the integration of HK and China, as rich Chinese are moving in, the poor would have to find places which are more suitable to their income level. But no local would ever want to leave HK for mainland. But it seems that the preferences of rich Chinese occupants and shoppers are changing and the government has created laws that forbid market speculations with apartments, so the future direction might be completely different. It will certainly be very interesting to see that. The minimum salary is now 30 HKD per hour, which amounts to about 5000 HKD per month. It was introduced as late as May 2011.